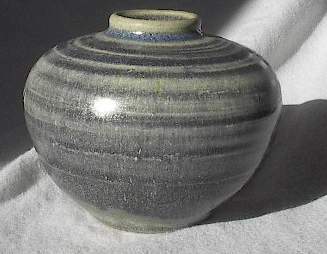 This piece is a vase I let harden halfway, then turned it upside down on the wheel and carved the lines on the form while slowly turning the wheel. 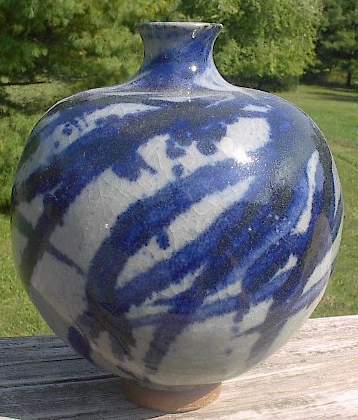 This is a medium blue glaze with Pete's Black glaze painted over it, becoming a dark blue in the carvings. 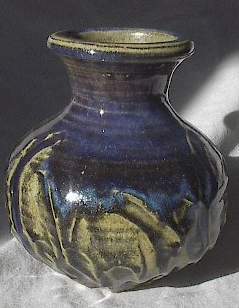 This piece is the only one I did like this my sophomore year; the grey glaze is Peach Blossom with Pete's Black on top, making the dark blue. 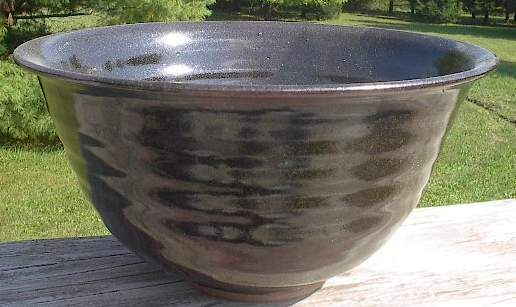 This bowl has a Mark's Temmoku glaze; it is a dark reddish brown glaze that looks somewhat crystalline, and is almost black where the glaze is applied or settles thicker. 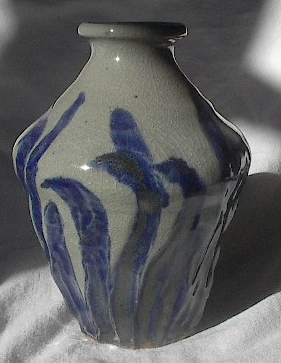 This piece also uses Temmoku, and the top has Pete's Black over the temmoku. 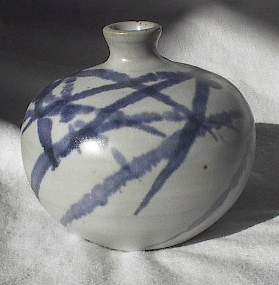 The next three pieces all use Fergeson's White glaze with black slip drawn over the glaze. 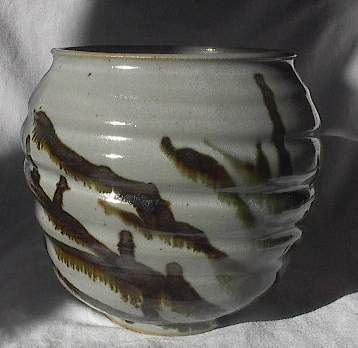 When it is fired in a hot part of the kiln, it looks as though it "runs" (seen best on the third piece). Almost all of these ceramics I did either my junior or senior year of college. The ones all on the left I did the fall of 2000, and the ones on the right were the fall of 2001. 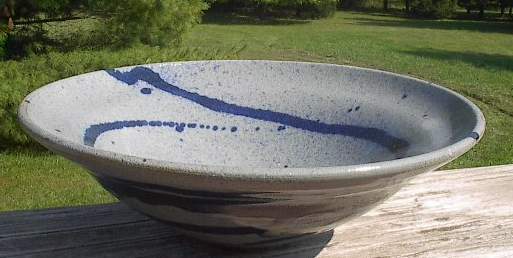 This isn't nearly a representation of the work I have done, because I have either sold some pieces at the craft sales or have given them away to friends and family. 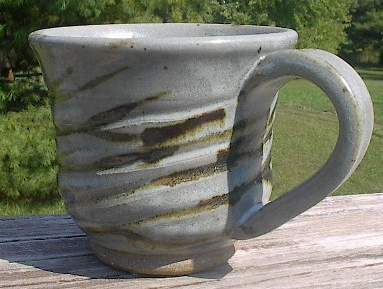 Ceramics is one of the things I feel absolutely connected to in my life. Ever since sophomore year when I first sat down at the wheel, it felt as though I finally knew what part of the arts I was meant to do. 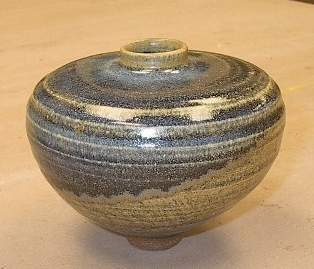 I mainly like to use the wheel, but also do like using the Raku clay and kiln. 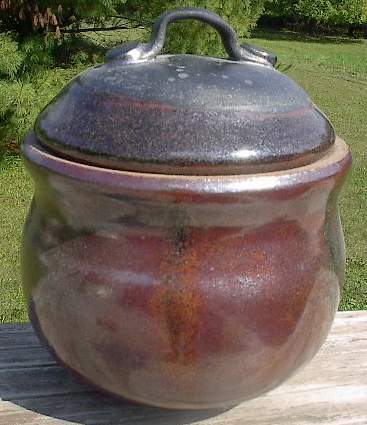 The difference with raku is that the pieces are taken out of the kiln at 1200 degrees F red hot, and placed in a barrel full of leaves/newspaper/sawdust to cool. 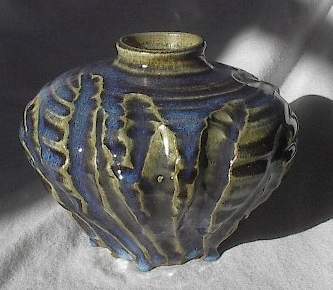 The type of firing I usually do is with stoneware and porcelain clay, fired in a gas kiln to cone 10 or 11. That roughly means about 1200 degrees C, or 2300 degrees F. Once the kiln completely cools, we take out the pieces. 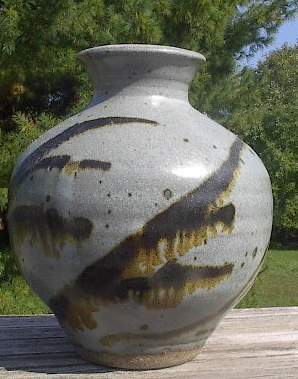 The next few pieces all use a CMG gold glaze; it is a yellow glaze that, when fired in the hottest parts of the kiln, it settles into a beautiful looking blue glaze. It is difficult to get the blue coloring, but I figured out (finally!) 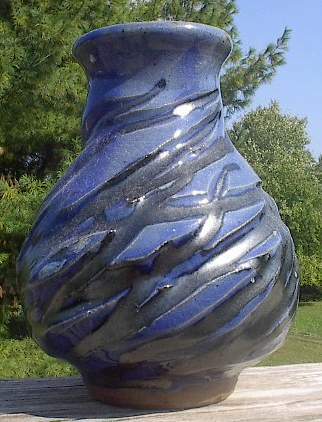 at the end of my fall semester what parts of the kiln will always give this end result. 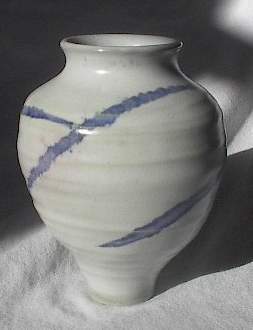 This first piece is white stoneware; the other three are stoneware. 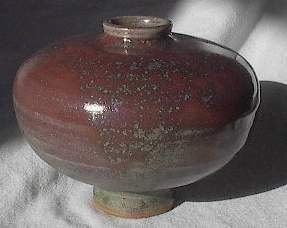 This piece is also fired in a hot part of the kiln to achieve this dark red out of the glaze. I used Georgia Green Black, and surprised the whole class when a few pieces came out this way. These next two pieces also once again use Peach Blossom and Pete's Black; it's a very popular combination with friends and family! 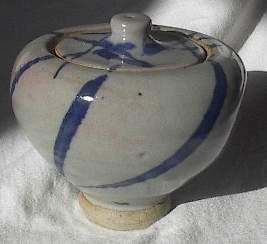 The top piece is stoneware while the next is white stoneware. I found that Fergeson's white and Pete's Black also make the blue color. The first piece is white stoneware, the bottom one is porcelain.